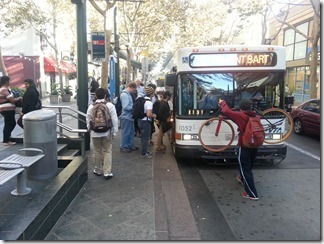 Passengers boarding the VTA 181 express bus to Fremont BART station in downtown San Jose. The VTA Board of Directors received word of the BART extension delay from staff at the August 3 Board of Directors’ meeting in San Jose. This means that the VTA “Next Network” transit restructuring has been moved until at least 2018. The Next Network service plan contains many benefits for Santa Clara County residents. It wouldn’t make sense, however, to implement most of these upcoming changes before the two new BART stations open in 2018. So, in general, it is accurate to say most Next Network operational changes are directly tied to the opening of the two new BART stations and will be implemented at the same time the BART stations open. There are a few things VTA riders can look forward to beginning in January of 2018, however, including free transfers between VTA vehicles, both buses and light rail. In addition, there may be some changes to bus and light rail service where it appears early implementation may be possible. Given that BART is pushed to June, 2018, I would imagine that the Palo Alto (Lines 88 and 89), Morgan Hill (Line 16) and Gilroy (Lines 14, 17, 18 and 19) could possibly be implemented in January. The other planned routes heavy rely on the BART, and NEW BRT 500 and 523 routes. More information will be posted as soon as it’s available. What are your thoughts on this news? Please comment below.